TS SSA Sectoral Officers Recruitment Results/Selection list 2017/ TS SSA Sectoral Officers Recruitment, Online Application form, Exam date 2017: ssa.telangana.gov.in Sectoral Officers recruitment, TS SSA Sectoral Officers recruitment, SSA Telangana SOs Recruitment Online application form, Sectoral Officers Written exam date. SSA Telangana has given the Sectoral Officers recruitment 2017 notification on 04-05-2017 and Online applications are invited for the post of Sectoral Officers in the DEO & Ex Officio District Project Offices of Sarva Shiksha Abhiyan from the Gazetted Officers working in the District concerned. 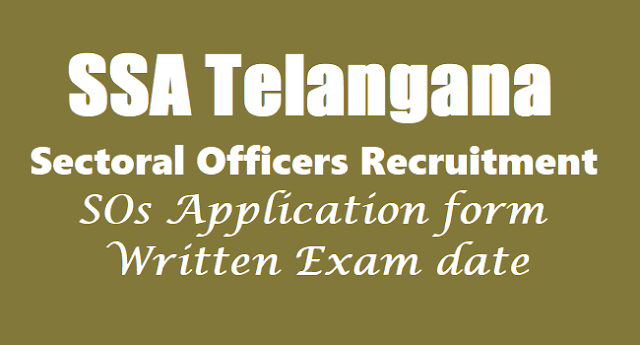 For eligibility criteria, qualifications and other information etc., details are given below or please visit website: www.ssa.telangana.gov.in and last date for submission application is 15.05.2017.
i)Candidates should invariably furnish NOC from their Reporting/ Controlling Officer. ii) Age limit: Age of the candidates shall be 50 years below as on 01.05.2017.
iii) The candidates shall have rendered at least 10 years of service in Education and Welfare sector. iv) The selected candidates shall work in terms of G.O. (P) No.10, Finance & Planning (FW.FR.II) Department, dated 22.1.1993 in the project. The candidate shall report to duty within 10 days from the date of receipt of deputation order. Otherwise, they will forego their candidature to join in the project. (v) The antecedents of the individual, previous experience, track record, ACR's etc will also be taken into consideration before continuing for deputation. (vii) The services of candidates will be reviewed every quarter and will be repatriated to the parent dept. in case of low performance I indulging in unfair activities I misbehavior I misappropriation of funds etc., without any prior notice. any right to the candidate for considering deputation and SPD has discretion to fix minimum cut off marks and merit for each post. Note: Separate merit lists will be prepared for Sectoral Officers. ( Plg & MIS, OSC) Gazetted Officers Gazetted Head Masters of School Education/Junior Lectures Lecturers MA/MSc., in Mathematics, Statistics/Computers & B.Ed/M.Ed by recognized Universities & Diploma in computers from recognized institutions. (IED, AMO, RTE) Gazetted Officers Gazetted Head Masters of School Education/Junior Lecturers/ DIET Lecturers, Preferably candidates with Spl. Education M.A/M.SC &B.Ed/M.Ed by recognized Universities preferably candidates with Spl. Education. (KGBV & CMO) Gazetted Officers /Cozened Head Masters of School Education/ Lecturers of DIETS. Female Candidates only MA/M.Sc../MSW & B.Ed/M.Ed by recognized Universities. Written test for 100 marks will be conducted. The questions in written test will be descriptive. Centre of examination, date and time will be intimated in the Hall Ticket. 13. Whether participated in any Educational : Activities? 14. Any contribution for the Education of : focus groups i.e., SC, ST, BC, Minorities and Children with Special Needs. 17. Address for correspondence with : Contact No. Online applications are invited from the Gazetted officers having service orientation, promoting Community Development with Special reforms in Education to SC/ST/BC/Minority/Girl Child/CwSN Welfare etc. for the post of Sectoral Officers and should be submitted -indicating the district where the candidate is working. If application is submitted for other districts shall be rejected. 2. The candidate should attend the exam hall at least 30 minutes before the commencement of the exam.